Each year, more than 350,000 people are admitted to UK hospitals with an acquired brain injury. That's one every 90 seconds. Although often hidden, the effects of a brain injury can be devastating for the entire family. Many survivors, family members and carers can often feel confused, isolated and alone. 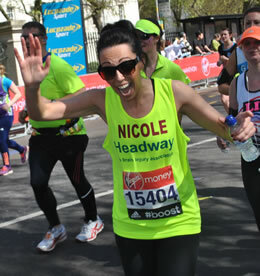 With the help of Headway's London Marathon runners, Headway can continue to provide and expand our life-changing services to those affected by brain injury across the UK.